Councilwoman Toni Iseman announced this week that she will run for her sixth consecutive term on the City Council. The decision was not an easy one, she said, but she felt compelled to run because of the significant issues facing the city. Iseman has never been shy about expressing her opinions. Angering voters may not be the way to win elections, but council members must not be afraid to make tough decisions, Iseman said. A resident since 1970 of Laguna Beach, Iseman was first elected to the City Council in 1998. “I was recruited then and I am still being recruited,” she said. She is the darling of Village Laguna. Iseman’s core values have not changed. She puts individuals first, residents’ well-being ahead of visitors, and preservation of the Greenbelt and Laguna’s unique character as essential. “The same, only better” has been her mantra for years. Once committed to a position or a project, she perseveres, even when on the short end of a 4-1 vote, nibbling away, perhaps asking if the motion-maker would consider changes in the motion. She frequently will request the mayor to extend the time allotted to a speaker about issues of particular interest to her or ask a question that prolongs public testimony. Iseman can be a pit bull, for example, her decades-long opposition to federal laws related to cell towers and to the Cox Cable franchise she calls a monopoly, both to no avail, but she can be practical when it suits her. She fought tooth and nail against moving the city’s corporation yard to ACT V, yet that relocation led to one of Iseman’s biggest triumphs: adoption by the council of her proposal to offer free trolley rides into town for tourists that park their cars at ACT V.
The free rides have resulted in increased ridership and fewer cars clogging city streets. Improving downtown traffic is one of Iseman’s pet projects. She considers the prohibition of southbound left-hand turns off of Coast Highway unless specifically permitted and the use of young traffic controllers on weekends at highly traveled intersections as two major achievements – although she is frustrated at the time it took to implement her ideas. “The traffic controllers took at least five years from the time I first thought of it,” said Iseman. She would like to take another shot at convincing downtown employees to park at Act V and be shuttled to their jobs. “It would have to be businesses with more than 10 employees and they would get paid from the time they park their cars,” said Iseman. 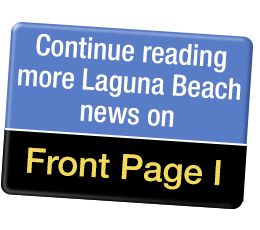 Another big goal is the installation of parking meters in South Laguna. She said South Laguna residents are concerned visitors would park free in the neighborhoods. “But that is what they are doing now,” Iseman said. Meters that offer longer parking would draw visitors out of the neighborhoods, she said. Iseman is also interested in a review of Design Review decisions. She has asked for the statistics on the number of homes reviewed; the number approved at the first, second and third hearings, the number turned down and the number appealed. She feels her election for a sixth term would help prevent the question from arising.